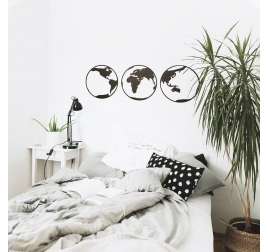 The world map wall decorations have always been very trendy objects for the interiors ! If you are looking to bring a contemporary twist while leaving your guests dreamy, these decorations will be the centerpiece of a successful interior. 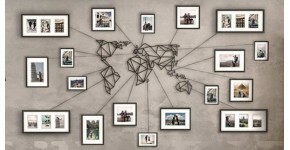 World map frame, aluminum map wall poster or our wood and metal wall decorations ... Everything is there to satisfy your travel desires to the four corners of the planet ! Take inspiration from our photos to discover unique decorating schemes with design frames, explosive colors or noble materials ... The best selection of wall decoration world map signed Artwall and Co ! 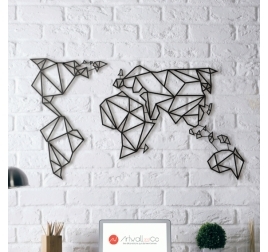 Find the map of the world on a metal wall decoration ! Travel round the world thanks to this unique metal design sculpture. The dimensions of this design wall decoration are 60 x 100 cm and 80 x 140 cm. Worldwide shipping for this metal wall decoration. The original Artwall and Co's World map entirely handmade with wood. The full size of this wooden wall map is 100 x 60 cm with a thickness of 6mm. Each country is written in French on this design wall decoration. Delivery around the world for this wood decoration. Our world map in relief with Artwall and Co ! The full size of this world map is 100 x 60 cm with a thickness of 6mm. Each country is of different color and relief. Worldwide shipping for this wall decoration. The original map of the world in metallic wall decoration. This metal world map is available in several colors : Black, White, Bronze and Gold. The dimensions of this metal wall decoration are 100 x 60 cm. Free delivery in Metropolitan France and Belgium for this world map design. Our metal world map in a bronze colour ! Stay at the top of trendiness with our bronze coloured metal planisphere. The dimensions of this bronze-coloured wall decoration are 100 X 60 cm. The delivery in metropolitan France and Belgium is free for our design metal map. Our famous wooden world map in a black version ! This world map is made of wood Mdf for a natural rendering. The dimensions of this world map are 105 x 50 cm. Worldwide shipping for this decoration. 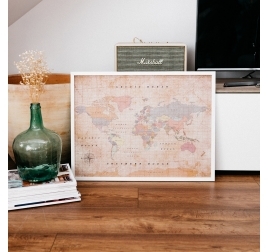 Our brand new cork worldmap with white frame in a vintage style ! 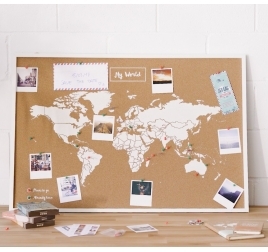 Ideal for travel enthusiasts, this map will allow you to hang all your memories. This map of the world is available in several sizes : M (60x45cm) and L (90x60cm). Worldwide shipping for this decoration. 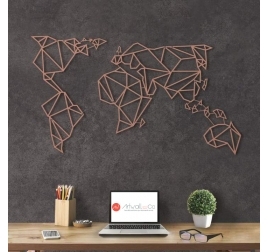 Perfect for large walls, this world map decoration offers a unique design. This frame is made of wood Mdf for a natural rendering. This world map is divided into three panels of 43 cm each. Worldwide shipping for this decoration. Our brand new world map collection of cork ! With white or black frame, this wall decoration will allow you to illuminate your interiors. The cork wall map is available in several sizes for your interior. Flag-shaped pine packs are available to put them on your favorite destination.